Why does ASE have a Dress Code? ASE believes and experts claim that there are many benefits of school dress codes. WE BELIEVE: BE SMART, DRESS THE PART! In order to maintain an appropriate educational atmosphere and to ensure safety and security for students, ASE expects students to wear the appropriate attire as voted on by our students and parents. ASE and CCLA Sweatshirts are permitted with appropriate dress underneath (see options listed above). undershirts, muscle shirts, camisoles, anything see-­‐through, strapless shirts, or backless shirts. 3. No sports jerseys (except CCLA). 4. T-shirts may not display inappropriate graphics and language. 5. Underwear, including bra straps and boxers, may not be exposed. 6. Any item exposing a bare midriff/stomach is not allowed. Pro Team gear including hats, jerseys, shirts, etc. are NOT allowed. Hairnets, bandanas, or wave caps are NOT allowed. Belt buckles with initials or graphic images are NOT allowed. Any Item or accessory that could be used as a weapon or could pose a safety threat (including but not limited to: long waist chains, overly-­‐sized rings, spiked gauges, etc.) is NOT allowed. All students’ clothing should be properly sized. a. Pants may have a relaxed fit, but may NOT be low riding. NO baggy pants. c. Belts must be of a proper length and have their ends tucked within the belt or pant loops. d. Skirts or dresses should not be shorter than mid-­‐thigh. 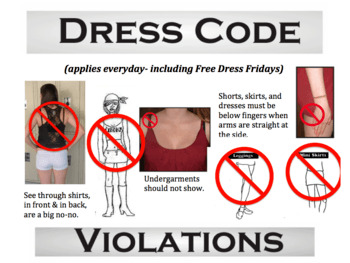 *Violation of ASE or CCLA dress code policy will result in detention and students may be required to change immediately. 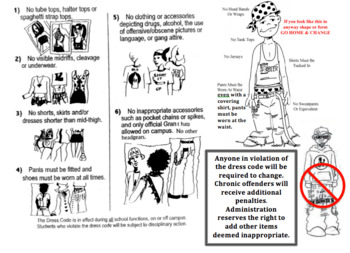 Students not wearing lanyards will also receive dress code violation detention(s). Accumulated detentions will result in the student being ineligible to participate in a variety of field trips and activities.